Okey dokey! Here is another week of info and recipes! I hop you aren’t too tired of the diatribe! Well… I REALLY hope you aren’t tired! Cause I verified with Farmer Byron today that our CSA is going to continue to the last week of OCTOBER! That’s nine more weeks! We are only half way through! That makes me think we are only half way through the summer too! Which brings me much joy! By far my favorite season is summer! I love the heat, the water, the sun, the outdoors, the fresh veggies warm from the garden, the summer thunder storms, the bugs (especially lightening bugs!) and of course our FANTASTIC CSA! I was thinking… our farmer has been SUPER generous with us and each week makes sure that he isn’t giving us TOO much produce! Who does that?!?!?! I’m thinking it would be nice to give him a thank you for working so hard for us and bringing our food each week with a smile and in abundance! I have no idea what we could give him… baked goods or a dessert with the fruit he brings? Gift card? just a thank you card? What do you give the farmer in your life?!?!?! So while I think on that, let’s look into our gift box for this week and see what we’ve got! Corn – I still have some of this left over from last week and was just brainstorming what I could do with it. My kids LOVE grits, and it made me wonder how you make them from fresh corn. Not possible with the corn we have, but I found the process interesting! It’s also been a LONG time since I’ve had corn chowder and that sounded yummy to me! We may give that a try this week especially since we have some potatoes and tomatoes to go in as well! The recipe I found looks fantastic and I can’t wait to give it a try. I’ll let you know how it turns out. Tomatos and cherry tomatoes – Last week my tomatoes started going bad and I pureed them before it was too late and cooked them down in the crock pot. This time I dind’t burn them! I left it on low for about 24 hours or until it was the consistency I was looking for. We had pizza tonight and used some of it and then I had two pint sized bags to freeze. It was a quick fix, doesn’t take up a lot of space in the freezer and will give us 2-3 more pizza meals on it! Red peppers (no hot ones this week) – I’m so glad to have red pepper instead of the green this week! We LOVE them raw as part of our lunch or as a crispy afternoon snack! They are good in salads or sauteing to go with fish (especially salmon) or in a stir fry! We eat LOTS of peppers and are excited to have red, even the kids noticed the color change! Potatoes – We don’t usually eat a lot of white potatoes, but they are nice to have on hand. I plan on using some for the corn chowder this week, and maybe I’ll make some french fries for the kids one day. I’m also planning on making some home fries with bacon and an sunny-side up egg on top for breakfast this weekend! I usually don’t buy these, and opt for yams or sweet potatoes… but these will do! We will find a way to gobble them up! Okra – Brian and I LOVE okra! As a friend was loading up she noticed the okra and donated them to us! So sad that someone doesn’t like okra! In the past I’ve washed and sliced it and dipped it in an egg wash and then in almond flour and a few spices like onion powder, garlic powder and paprika and then baked at 400 til they were tender. They were delicious, even the kids like them! There is also a West African dish called Mafe we enjoy that we usually put okra into, which helps thicken and hold it together for eating with hands! Purple Cabbage – You can eat this the exact same way as the white or green cabbage. The color will bleed into the other veggies if there is a dressing on it, so beware! But it certainly won’t affect the flavor. I really like the color it adds to summer salads! This kale salad from a friend of ours calls for purple cabbage and a few other ingredients we’ve received in our box this week. This is one of my favorite kale salads EVER! Green beans – These green beans that we received this week look amazing! Tender, small and bright green! I can’t wait to eat them! These are some of my kiddos favorite veggies and they love them sauteed on the stove with some garlic and onions with fresh lemon juice and spicy mustard on top. I know the combination sounds off, but it really is good! You gotta give it at try! It might be a new favorite for you! Zucchini – We’ve had zucchini noodles a few more times this past week and will probably do it again! It’s so tasty and delicious! I’m also thinking of making some choclate zucchini muffins for the kiddos for a treat too! I know… not much different from last week, but these are our faves! White peaches and some yellow peaches – Eat them plain! Fresh, juicy and scrumptious! EVERY day this week Aisling has been asking me if she can eat the peaches out of the bowl. Some of them weren’t ripe so I kept telling her no. When they were soft and I finally said she could eat one, she pulled one out that looked fantastic and when she turned it over it was half eaten… she had been sneaking bites!!! Haha!! Made me laugh… the boys ate a whole peach and she only got ½ of a ripe one… she snuck bites when it wasn’t even sweet and juicy. We talked about it and she was disappointed, but I thinks maybe she might wait next time… we have another bowl of them… so time will tell! Nectarines – These aren’t usually a favorite of mine, but since they are farm fresh that my make all the difference. Another fruit to eat fresh! I don’t ever purchase these in the grocery store because the are never perfectly ripe and are usually grainy and then we don’t eat them and it’s a waste of money. I’m sure these will be different! Stay tuned! So there you have it! 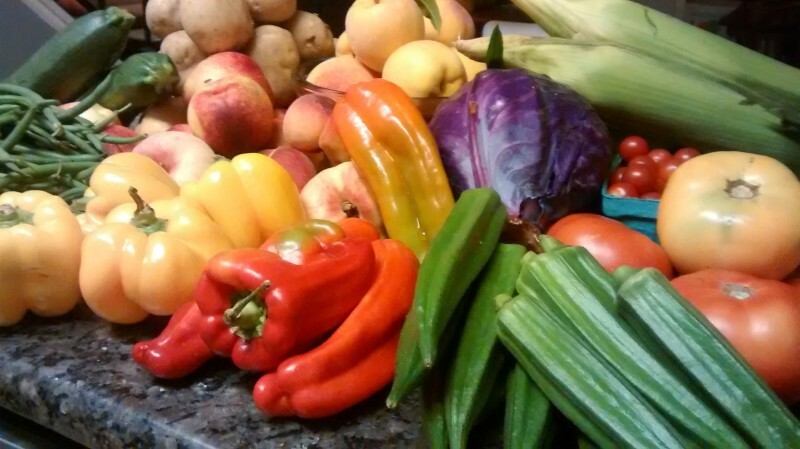 Another week in fresh vegetables! PLEASE share your good ideas of how to eat and enjoy them!